Recent design trends indicate an increasing use of higher quality 3-D data. nStyler is a real-time visualization program that is compatible with various CAD software, such as Rhinoceros, SolidWorks, NX, CATIA, thinkdesign, and Pro/Engineer. 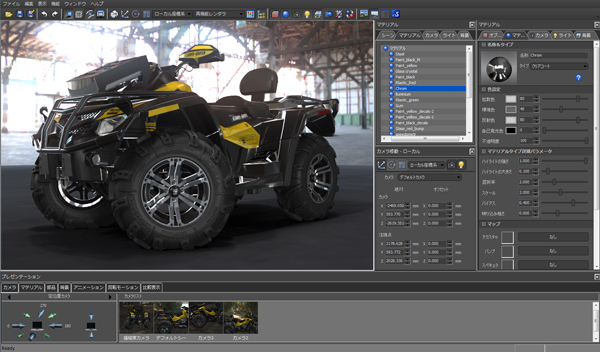 By utilizing light-weight optimization tools that are implemented in the application, nStyler is capable of rendering, in real time, data of up to 10 million polygons through optimization of 3D scenes. 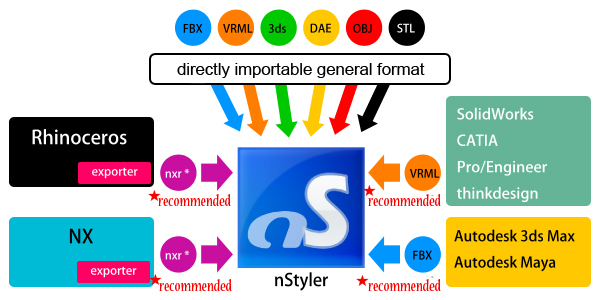 nStyler 2014 is a free software as it is, so you can download it from this site. If you are using Rhino, purchasing exporter from Rhino, you can export .3dm file to .nxr (nStyler native file) with layer and material information. If you need exporter,click here.